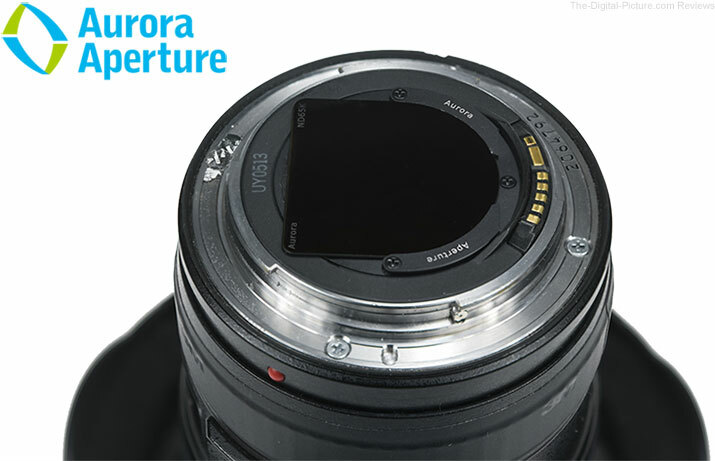 Press Release: Aurora Aperture Introduces PowerND Family and an Industry First Rear Mount Glass Filter for Canon EF 11-24mm F4L USM Posted on April 21, 2017 Irvine, California, April 21, 2017 – Aurora Aperture Inc., a Southern California startup, today has introduced the PowerND family of high quality fixed neutral density (ND) filters. A small rear mount filter using Gorilla Glass for the Canon EF 11-24mm F4L USM is an industry first. Prior to this users would have to use extremely large filters with diameters up to 186mm with a bulky front lens shade adapter. The Aurora CR format filter mounts in the rear of the lens, making it much easier to carry and lower in cost. Other Canon lenses that Aurora CR format filter can be used in* are the EF 8-15mm f/4L Fisheye, EF 11-24mm F4L USM, EF 14mm f/2.8L US, EF 15mm f/2.8 Fisheye, EF 16-35mm f/2.8L USM, and EF 17-40mm f/4L USM. I know, you thought that you could avoid math if you pursued photography. But, there is one math test that all photographers must pass. 1. When was the last date you captured an image that you care about? In the equation above, that's value "A". 2. When was the last date you backed up all of your images with a copy stored at a trusted off-site location? That's value "B". Subtract your second answer from your first to get "C", a duration in days (or go to hours for a higher precision). I know, date subtraction is not so easy, but ... hopefully the answer involves a small enough number for you to do the math in your head. If the result is a near-zero value, I congratulate you heartily (0 is the perfect score). You are among a minority. If you needed to resort to a date calculator app to solve this math problem, you are in imminent danger of losing something important to you, perhaps an image collection that has taken a decade or longer to create. If your duration-since-last-backup calculation is multiple days, right now is when you need to do something about this problem. It is only a matter of time until you lose the images captured since your last backup – you can be assured that failure will happen. If you don't know where to start, buy a few WD My Passport external hard drives at B&H, Adorama or Amazon. I have dozens of these drives, have used them for roughly a decade and have had no failures ever (I know, I'm due). These drives are very small (great for portability to the referenced off-site location), reasonably-priced and, with the latest models arriving in 4TB capacities, they hold a LOT of high resolution photos. Simply copy all of your images (and any other important files) to two or more drives and move at least one to a safe off-site location. Best is to use a rotation of multiple drives that insures all copies are never in the same location. Being a bit paranoid (AKA experienced in these matters), I use a double redundancy approach. Hopefully you sleep better knowing that your images are safely backed up. If something terrible happens, such as a house fire, you can focus on getting you and your loved ones out of the house instead of making a desperate rescue attempt of a prized image collection. Timely is that after I initially created this post but before I shared it, the SSD (Solid State Drive) in one of our laptops became corrupt. Again, right now is the time to shore up your image preservation strategy. As I mentioned in the Irix 15mm f/2.4 Blackstone Lens review, a significant March snowstorm simultaneously arrived with this lens, dumping 19" of snow in less than a day. While that snow volume may seem miniscule to those in some locations, the amount was (or nearly was) a 24-hr record for this area. And, after the snow fell, the wind started. Wind of course brings about snow drifting and I knew where I might find some drifting effects to capture. 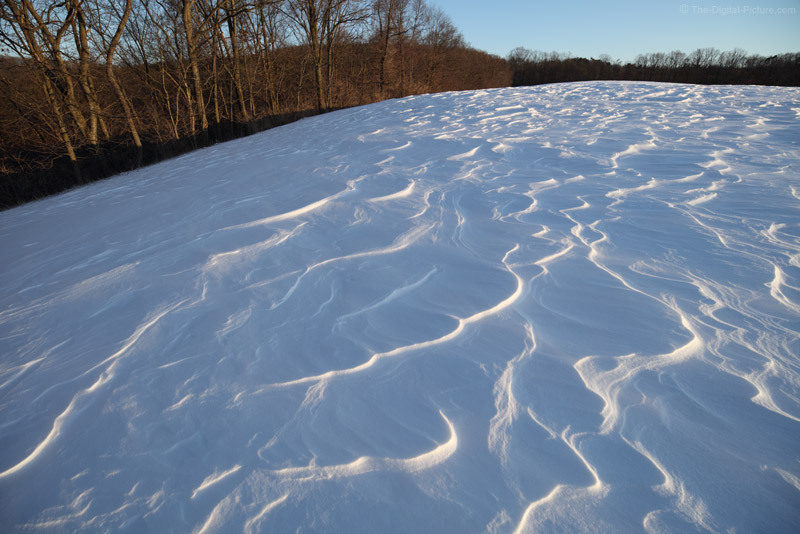 A 1 mile (1.6km) jog/hike in knee-deep snow brought me to a mountaintop field just prior to sunset where I successfully found interesting wind-formed wave-like patterns in the snow. The late-day low sun angle meant the patterns were side-lit, emphasizing their shapes along with some color temperature variance occurring between the sun-lit and shaded areas. One of my favorite uses of wide angle focal lengths is to make close subjects appear large in relation to what is behind them and to keep what is behind them in sharp focus. The 15mm focal length worked great for application of this concept, emphasizing the uneven snow in the field. Note that I had to be careful to keep my shadow out of the frame. A funny story: I took a somewhat different route back to home and unwittingly stepped over the edge of a bank and into a deep snowdrift. After sinking in well over my waist, the angle of the ground (once I finally reached it) caused me to continue sliding at an angle, leaving me strongly tipped and in about shoulder-deep. Any attempt to move caused me to sink deeper and trying to dig out was ... an unusual experience. Fortunately, the camera and lens were in a Lowepro Toploader Pro 70 AW case, so no worries there and after I brushed off, only the humor of the moment was remaining. Remember – photography can be as much about creating stories as it is about telling them. If you do not already have an ultra-wide angle lens in your kit, definitely check out the Irix 15mm f/2.4 Blackstone or Firefly Lens. 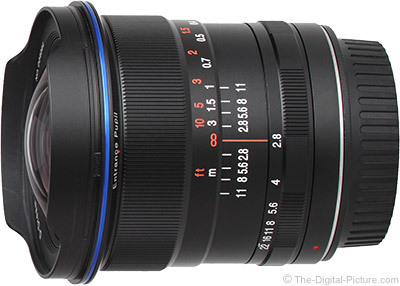 Either version of this lens can add a lot of capability to your kit for a low cost. One of the most common questions I receive is "Blake, how do I color correct my photos". For the longest time, I avoided this question like the plague because color correction can be done in so many ways. There are automated methods like selecting the color temperature and even simpler, pressing auto. However, these prescribed methods don't always produce the most accurate results and can sometimes make your image look worse than it did before you started. I developed a pretty simple three-step method for color correction that is nearly infallible. It uses the vibrance adjustment to find out which color is most dominant, then the principles of color theory to correct for it. Update: Canon EOS 7D Mark II Firmware v.1.1.1 is no longer unavailable due to a W-E1 communication error bug. 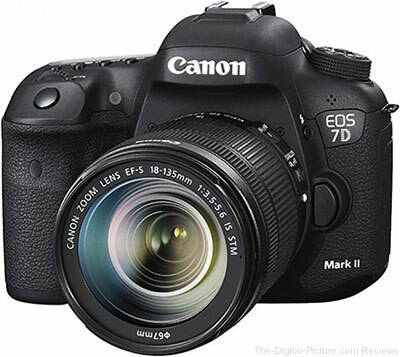 B&H carries the Canon EOS 7D Mark II DSLR Camera. 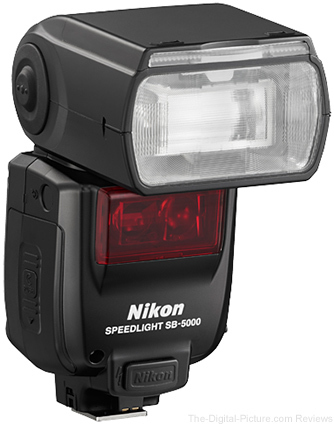 Nikon has published Nikon Technical Solutions | Radio-Controlled Advanced Wireless Lighting Tips for owners of the SB-5000 AF Speedlight, Nikon's first (and so far, only) radio-enabled flash. OBERKOCHEN/Germany, 24/04/2017 - No matter if it is Star Wars, Harry Potter or Avatar: these days, just about every film features special effects. For many small film productions, having visual effects in their movie would be a dream come true. Unfortunately, making the image fit the look of the footage has required expensive tools – until now. At the NAB Show in Las Vegas, ZEISS presented new metadata technology that makes this possible: the company has equipped its new ZEISS CP.3 XD compact lens family with ZEISS eXtended Data. What exactly is this? "ZEISS eXtended Data is the first metadata technology which stores the lens distortion and shading – for every single frame," explains Christophe Casenave, Product Manager at ZEISS. "Moreover, all /i-Technology metadata are recorded, including the focus distance, aperture value and depth of field, which is supported by most cameras." This makes the technology ideal for working with visual effects: by using the metadata, it just takes a few clicks to modify the image generated on the computer to fit the lens characteristics, and to then splice it together with the footage to create a realistic image. Distortion and shading can be corrected or even amplified in post-production. "It used to be that only big blockbusters could take this approach," says Casenave. "Cine lenses that provide metadata are relatively expensive and, up until now, distortion and shading had to be manually measured – a time-consuming and expensive process." However, since ZEISS has incorporated the technology into its compact CP.3 XD cine lens family, low-budget productions can now take the same approach to creating their own special effects. "With ZEISS eXtended Data, we are offering Hollywood technology for everyone, providing small film teams with new creative opportunities." With the ZEISS CP.3 XD, ZEISS not only offers the lenses with metadata, but has also given thought to storage and processing. It has teamed up with partners in the industry: the company Ambient has developed the MasterLockit Plus system together with ZEISS. It records all metadata along with a time code in case the technology is not supported by the camera. "This way truly everyone can work with ZEISS eXtended Data, no matter what equipment they use," says Casenave. Thanks to the cooperation with the software developer Pomfort, distortion and shading can be modified on the set in real-time using the Pomfort tool LiveGrade Pro. The film crew already gets a sense of what the final look will be during the shoot. The film clips and lens data can be consolidated and organized with Silverstack, Pomfort's file manager. ZEISS plans to further expand the new metadata technology in the future. "Our customers will then be able to upgrade to the new version, making the CP.3 XD a long-term investment," says Casenave. In addition to the metadata, filmmakers have even more reasons to get excited about the new lens family: the ten prime lenses between 15 and 135 millimeters cover full-frame. As is typical for ZEISS, the image has a clean, crisp look, and ZEISS says the image quality is excellent. "These lenses deliver outstanding results, even in light situations with a large dynamic range, i.e. highlights and shadows within the same scene," says Casenave. The maximum speed of the seven focal lengths between 25 and 135 millimeters is T2.1, the 15, 18 and 21 millimeter lenses have a speed of T2.9. With a front diameter of 95 millimeters, the lenses are light-weight and compact. They are particularly well-suited for hand-held filming or shooting with gimbals, Steadicam or drones. ZEISS has also improved focusing: the manual focus is now noticeably smoother. According to ZEISS, it is comparable with the ZEISS Master Primes and can also be operated with a small motor. The focus rotation angle is 300°. The lenses are equipped with an interchangeable mount so that they can be used on almost any camera. In addition to the ZEISS CP.3 XD, there is also a version available without metadata: the ZEISS CP.3. 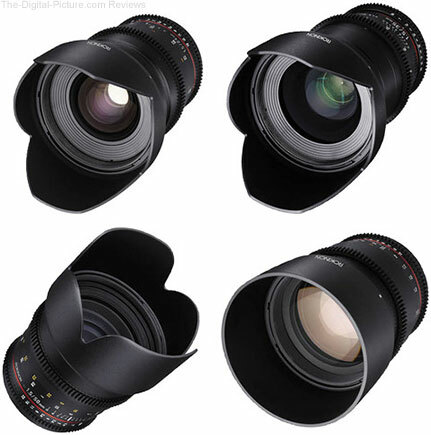 Initially, a limited number of ZEISS CP.3 XD and CP.3 lenses will be available at dealers. B&H will carry the Zeiss Cine lenses. A macro lens will help you get up close and personal with your subject, allowing you to capture details that may not even be visible with the naked eye. Enriched detail, together with impressive depth of field separation, also makes these lenses great for more than just macro shots. If you'd like more information on macro lenses, check out our post Photography 101: What Is a Macro Lens? Does the Venus Optics Laowa 12mm f/2.8 Zero-D Lens have Zero Distortion? Distortion test results have been added to the Venus Optics Laowa 12mm f/2.8 Zero-D Lens page (a full review is planned). The Venus Optics Laowa 12mm f/2.8 Zero-D Lens is in stock at B&H. Permalink: Does the Venus Optics Laowa 12mm f/2.8 Zero-D Lens have Zero Distortion? Canon has released their finanicial results for 1Q 2017. See below for more information. Sydney, Australia, 26 April 2017 – Canon Australia has announced that Season 2 of the brand’s locally produced Tales by Light photography adventure series will stream globally on Netflix from 21 April, following the successful launch of the Season 1 in November 2016. A stunning cinematic experience, Tales by Light Season 2 builds on the concept established in the first series, following the journeys of acclaimed photographers as they pursue their personal projects. Comprising three in-depth episodes, Season 2 shows the endeavours of the photographers to challenge people’s perceptions through their art. Prior to joining the Netflix documentary content line-up, Tales by Light Seasons 1 and 2 screened initially on the National Geographic Channel subscription network in Australia and New Zealand. Canon Australia has been on its own journey for the past several years, moving from the traditional focus on products and features into content and experiences that entertain, educate and inspire with the focus firmly on the photographer and their needs and ambitions. We give casual drone users the changes to fly using the DJI Goggles for the first time anywhere. Experience this incredible new way to fly along side them. B&H has the DJI Goggles available for preorder. B&H has the Rokinon 24, 35, 50, 85mm T1.5 Cine DS Lens Bundle for Canon available for $1,749.00 with free expedited shipping. Regularly $2,326.95. Fixed an issue that prevented additional deletions after multiple shots had been deleted in succession from a single burst of pictures. B&H carries the Nikon 1 J5 Mirrorless Digital Camera.